It’s been a busy few months as we approach the wedding. It’s crazy to think that it is just 4 short weeks till we’re getting married! It only seems like yesterday that we were standing on a bridge in Paris getting engaged. Then there were parties to celebrate and plans to put in motion and before I knew it here we are, the countdown has begun! When people tell you an engagement goes quickly, listen to them as it does. Anyway all that planning, ordering and making things has meant that neither me nor Hana have spent as much time in the kitchen of late, I’d been in a culinary rut and needed a bit of inspiration. Luckily a couple of weeks ago I came across Rick Stein’s new series to give me some much needed inspiration, From Venice to Istanbul. The seven part series takes the Cornish chef from Venice to Istanbul as he traces the trade routes between the Venetian and Byzantine Empires. It’s a great series which takes in some of my favourite cuisine from Italian to Balkan, Greek and Turkish. The episodes, and accompanying cookbook, contain some really fantastic recipes which I’m really looking forward to preparing. We have tried two recipes (stuffed vegetables and walnut crusted pork chops) so far and both have been an instant hit. The Pork is really special, something which is perfect for a cold winter’s evening – it would make a great alternative Christmas meal. 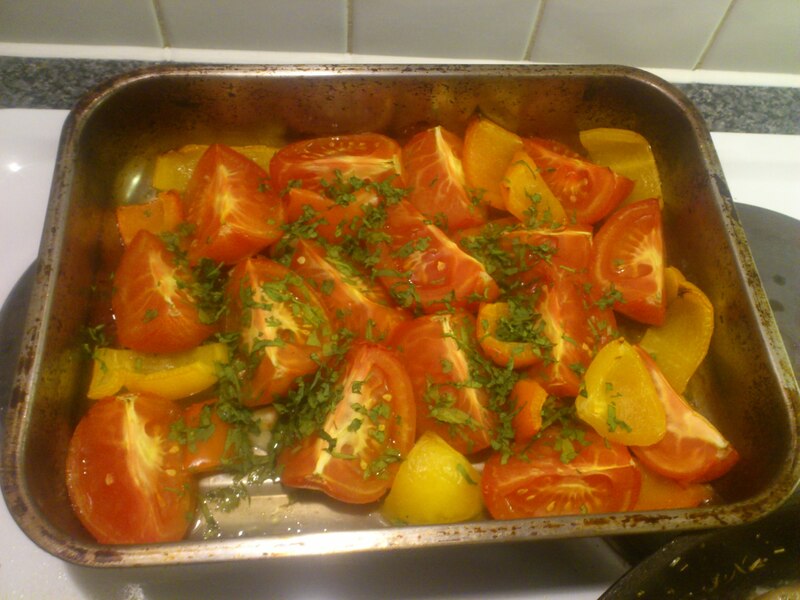 The stuffed vegetables tasted fantastic too, and they’re something you can comfortably make on a weekday evening. You can make the filling ahead of time, stuff the vegetables and pop them in the oven when you get home from work. I made a few changes to Rick Stein’s recipe, available here from the BBC. Most notably he uses a long grain rice. I wanted to use a rice which would soak up the flavour of all those tomatoes and herbs so I opted for using arborio rice instead. Personally I prefer the texture that this lends to dishes like this but, it did increase the cooking time, By quite a bit. As there was just the two of us I also just used a couple of tomatoes and a couple of peppers. If you are cooking for more people then I’d say by all means also use the aubergines and courgettes but we wouldn’t have wanted all that at once. We like things with a little more of a kick so instead of an eighth of a teaspoon of chilli I used a just under a full teaspoon. We felt they weren’t quite enough by themselves so I pan fried a couple of fillets of haddock in some olive oil and butter. Dust the skin side of the fish in flour and pop, skin side down, in a pan with some warm olive oil. Cook for around 5-6 minutes – till the skin is crisp. Turn it over and and add the butter to give a nutty flavour to the fish. Prepare the onion and garlic and set to one side. Scoop out the inside of the tomatoes and reserve. Hollow out the peppers, discard the seeds. Retain the tops of the peppers and tomatoes. Start by preparing the vegetables for stuffing. Cut the tops off the peppers and tomatoes to create lids, set the tops aside. Scoop out the pepper seeds and discard. Scoop out the tomato flesh and seeds and reserve. Cut the aubergines and courgettes lengthways and scoop out the seeds and flesh inside, leaving a boat-shaped shell ready to fill. Add the flesh from the courgettes and aubergines to the tomato flesh and seeds and chop well. In a large pan over a medium heat, warm 3 tablespoons of the olive oil and fry the onion and garlic for 3–5 minutes until soft. Add the chopped vegetable flesh and the tomato purée. Cook for about 10 minutes until softened. Add the rice and 150ml/5fl oz of the vegetable stock, raise to a simmer and and cook for 10 minutes, stirring occasionally. Season with salt and pepper and stir in the herbs and chilli flakes. Arrange the vegetable shells on a roasting tin or ovenproof dish and spoon the rice mixture into them. Place the lids on the peppers and tomatoes and drizzle them all with the remaining olive oil. Pour the remaining stock into the tin, cover with foil and bake for 1 hour. Remove the foil and bake for another 15–30 minutes until the vegetables and rice are cooked. Rick Stein, Venice to Istanbul is currently available on the BBC iPlayer. I enjoyed Rick Stein’s Greek program today, following Byron. All the food looked good, must try the stuffed veg. Thanks. rick stein’s Greek stuffed vegetables : the dish was tasteless and the rice uncooked. I needed to quickly add a tomato based stock to each veg & season better. Also highered the oven temp. To 185. It took in all nearly two & a half hours to cook – 160 is far too low. I will stick to my own recipe in future.